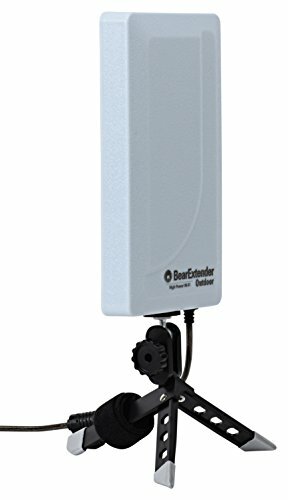 BearExtender Outdoor combines a high power internal Wi-Fi amplifier and a high gain 10 dBi directional antenna. The specially designed case is IP65 certified water and dust resistant to ensure the internal components stay dry even in the harshest weather conditions. The case is also pre-treated with an anti-UV and anti-corrosion protective coating for outdoor use. BearExtender Outdoor uses award winning proprietary receiving technology with 1000mW max RF output power for long range Wi-Fi reception at an affordable price. The built-in 10 dBi panel directional antenna focuses reception in one direction for optimal results. Because it does not pick up networks in directions it is not aimed, you may see weaker reception in the opposite direction vs. your computer's on-board Wi-Fi card. Overall range will vary based on environment. Placement higher up can improve results. At normal desktop level, range is about 2-4 times that of a computer's built-in Wi-Fi. To receive a Wi-Fi signal you must be within range of one that you have access to, such as your home network or a campground or public hotspot. Use the detachable tripod stand for easy placement on the desk next to you or in a nearby window sill. It also mounts easily using the included Velcro strap or adjustable pole mounting band and can be placed up to 16 feet away from your computer thanks to the integrated 16 ft premium shielded USB cable. Compatible with Microsoft Windows Vista, 7, 8/8.1 and Windows 10 (Win 10 use requires download from our support page). Not compatible with Mac OS X, iPad, iPhone, iOS, Android or Windows RT tablet operating system. Not a standalone repeater. Extends the Wi-Fi signal only to the computer to which it is connected by USB cable. It is not a repeater or router for multiple devices. Not a 3G, 4G, LTE or cellular booster. Long range 802.11n 2.4 GHz USB Wi-Fi booster with built-in 10 dBi directional antenna and integrated premium shielded 16 ft USB cable draws power from computer (no AC power supply needed). Ideal for RVs, boats and camping. IP65 Certified water resistant and dust resistant enclosure is pre-treated with an anti-UV and anti-corrosion protective coating. Includes 3 versatile mounting options: Detachable tabletop tripod, adjustable metal pole mounting band, and Velcro pole mounting strap. Compatible with Microsoft Windows Vista, Windows 7, 8/8.1 and Windows 10 (Win 10 use requires download from our support page). Not compatible with Windows RT tablet, Mac OS X, iOS or Android. If you have any questions about this product by BearExtender, contact us by completing and submitting the form below. If you are looking for a specif part number, please include it with your message.